Chat tags are labels you add to chat sessions to help you categorize and sort your website's chat sessions. Agents select tags from an administrator-defined list and add them to chat sessions they're serving. They can add tags individually or by using a shortcut with tags. For details about adding tags to chat sessions, see Adding tags to chat sessions. Note: Chat tags apply to specific chat conversations, not to the visitor in general. Chat tags are separate from API and trigger tags. 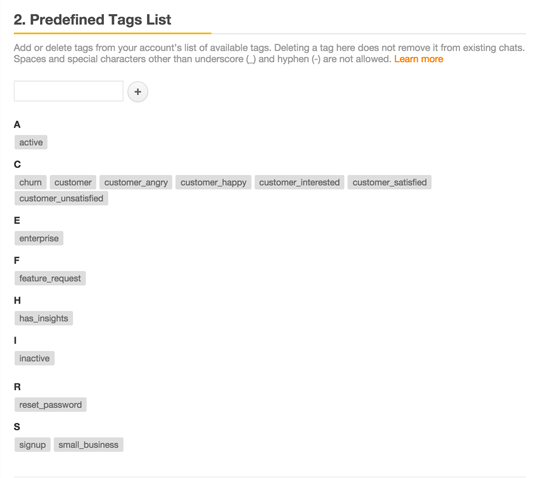 For details, see Understanding different types of tags in Zendesk Chat. Regardless of your settings, all administrators can create and delete tags in the Predefined Tags List ( Settings > Account > Chat Tags tab). For details, see Editing available tags in the Predefined Tags List. Note that this setting is enabled by default. Under Settings > Account, select the Chat Tags tab. In the General Preferences section, check the Allow Tag Creation check box. The Predefined Tags List, available under Settings > Account > Chat Tags tab, contains all chat tags for your account. If a tag isn't on the list, it won't be available for agents to add to a chat or shortcut. Updates to the Predefined Tags List take affect in real-time: logged-in agents see them automatically without having to log out and back in. If you remove a tag from the list, it stops being available to agents but isn't deleted from past chats. If the Allow Tag Creation setting described above is enabled, new tags that administrators create in shortcuts and during chat sessions are added to the predefined list. Tags created in History are also added. Add a new tag by typing it in the empty field. To add more than one tag at once, click +. Click an existing tag from the list to select it for deletion. You can add tags to shortcuts so that when an agent uses the shortcut, the tags are applied to the chat. For details about using shortcuts with tags, see Adding tags with shortcuts. Create or edit a shortcut following the steps in Inserting common phrases with shortcuts. 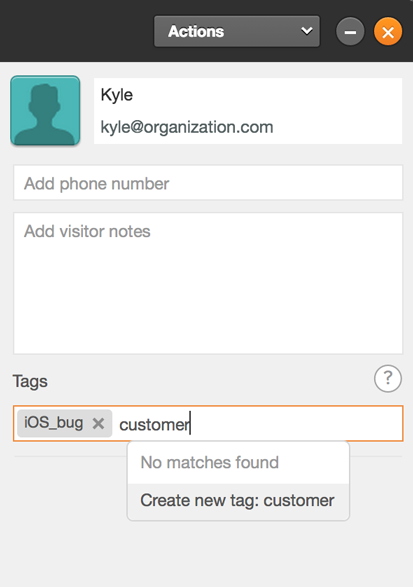 In the Tags field, enter tags you want to add to the shortcut. Depending on your settings, you might have the option of creating a new tag. For details, see Creating tags in shortcuts and during chats. This section applies only if you've enabled the Allow Tag Creation setting. For details, see Determining how tags are created. 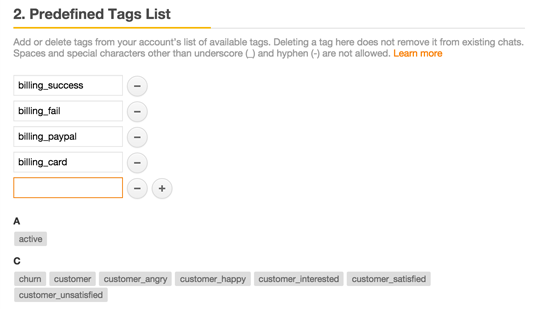 In the Tags field, start typing the new tag. The Create new tag option appears. Click on Create new tag. Start typing the new tag. The Create new tag option appears. Administrators can delete tags, add tags, and create new tags for past chat and offline messages in History. When you create a new tag here, it's automatically added to the predefined list. It's not synced to any related Zendesk Support tickets. Agents don't have access to modify tags in History. From the dashboard, select History. Click on the chat you want to edit tags for. Click the pencil icon next to Tags. Click the X next to any tag to remove it. Start typing a tag to add it. Select a matching tag from the list or click Create new tag.